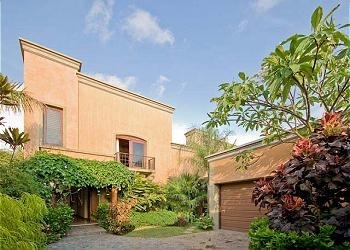 CASA SANTOSHA- A lovely, well cared for, and private house less than 150 meters from the beach in Playa Langosta. 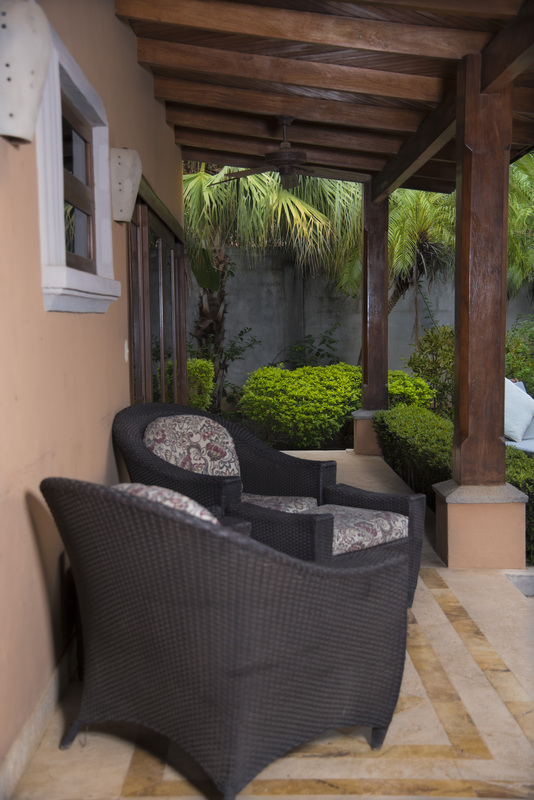 Conveniently located near the Langosta Super Market and various restaurants and activities, Casa Santosha offers you the opportunity to do everything or nothing at all! Only a mile from Tamarindo you can use the 3 new beach cruiser bikes provided free of additional charge to pedal to town or even walk to shops, more restaurants, and the night life. Each of the three master suites is fully air conditioned with ceiling fans and all have a TV, stereo system, and DVD player. The backyard is private and has a covered patio that access 2 of the master suites overlooking the pool. 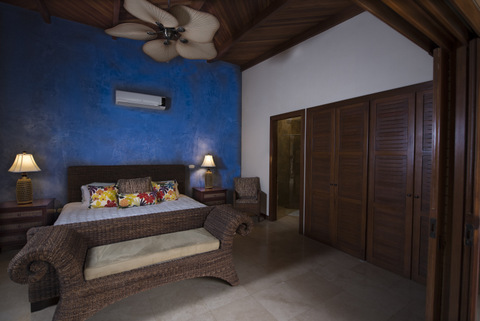 The master bedroom located on the top floor overlooks pool and backyard from one balcony and the entrance of the villa from the other balcony. 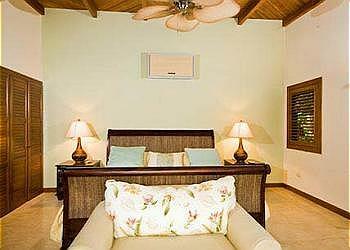 The house also comes with more amenities such as 3 beach cruisers, Wi-Fi, phone line, maid service, wine cooler, and more. This home is ideal for couples and families offered to you at a great price! Casa Santosha sleep up to 7. 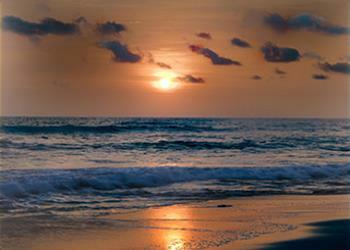 Santosha means contentment in Sanskrit- come experience true contentment in beautiful Costa Rica! The house was beautiful. 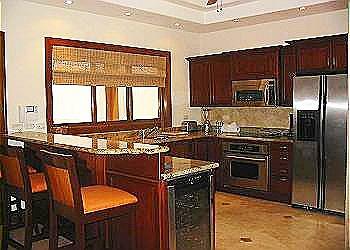 It was spotless and had every amenity you could want from a fully equipped kitchen an immaculate pool. The layout of the house was perfect for 3 couples and gave total privacy to each couple. Response:Thank you so much for the great review and so glad you had a great time. We hope you will come and stay with us again! 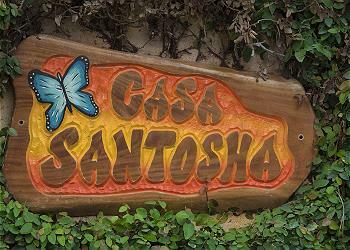 We stayed at Casa Santosha, November 19-27, 2018. We were 3 couples and the house was set up perfectly for us, with 3 bedrooms all with king beds and ensuites. There was a safe in each room, although one didn't work. Maintenance came quickly when we called and did try to fix but couldn't. But no biggy we just shared the safe in the next bedroom. The pool was awesome for those hot afternoons. The house was in a great location with a small grocery store 1/2 a block away, restaurants with walking distance and the RPM office very close by. The beach is a very close walk as well. It would have been nice to have a few folding beach chairs supplied. The Cave restaurant had just opened and was excellent food. The El Sapo Pizza place had great pizza! There were others we didnt get a chance to try. You could also easily get to Tamarindo by bikes or by cab for $1 per person. The house was in good shape and was as described. We even had a pet cat that stays at the house. Response:Thank you so much for the great review. We are so glad the house was perfect for all three couples. It's a great house for family or friends. We hope you will come and stay with us again! We spent 10 days at this beautiful home with 2 families. The house had plenty of room for all of us to enjoy. We spent our mornings at the pool and then would walk to the beach. When we had issues with anything in the home, the response was quick from the management company to address. Thank you for a wonderful vacation. Response:Thank you so much for the great review. We are so glad you had a great experience. We look forward to having you stay here again. Response:Thank you so much for the review. Please come back and visit again. Terrific! The house was great! The staff was very responsive when we had issues. We had a problem with the A.C. and the technician didn't leave until it was fixed which was late in the night. The location was awesome, beach was beautiful, we even saw monkeys! Thank you! Response:Thanks Ronald for your nice review. 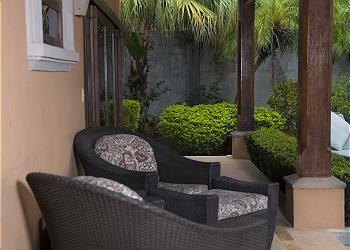 We are happy that you enjoyed your stay at casa Santosha. Hope you can come back soon and stay with us again. 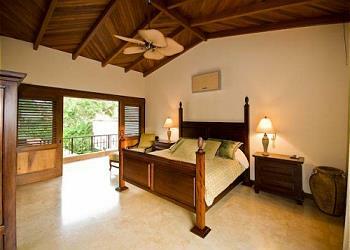 Casa Santosha is sensational - it comfortable and very well appointed. It had everything we needed to have a fun, relaxing vacation. It is so convenient to the beach and town. The management staff was very friendly and very helpful. The house was neat, clean and orderly. Couldn't have asked for anything more and would definitely stay there again! Response:Thank you for the great review. 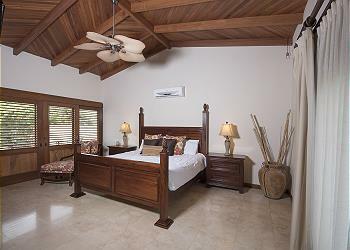 Casa Santosha is truly sensational and we are so glad you enjoyed this wonderful house. Please come stay at Casa Santosha again. Response:Thank you very much for the great review and details to help others. We hope you will come back and stay with us again! The house was amazing. So was the location. Close to the store and to the path to the beach. I would defiantly stay there again. Response:Hi Jeff - We hope we can see you again soon! Glad you enjoyed your stay! Response:Thank you so much for the great review. We are so glad you had a great time at Casa Santosha. It is truly a beautiful home. We hope to see you again soon. Contentment indeed! 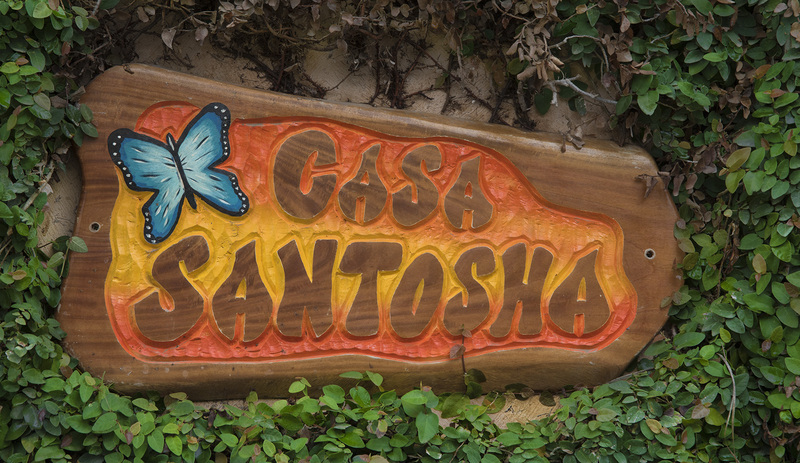 We had a wonderful experience at Casa Santosha. 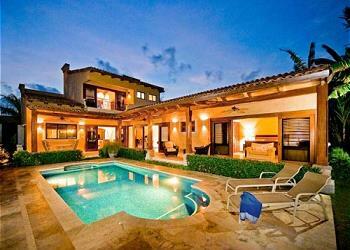 This beautiful home is comfortable, conveniently located and offers all the amenities of home. Fully stocked kitchen, Wi-Fi, beach cruisers and a private pool offers something for everyone. Made our stay very enjoyable! 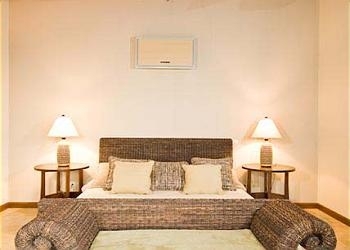 Response:Thank you for your review and comments about Casa Santosha. It is a great home. We hope to see you again. Casa Santosha was better than Fabulous! It's a perfect house for a relaxing getaway and fun adventures. We felt the love the minute we walked through the door. Ours was a girls vacation and the set-up of the house worked great for this. We spent a lot of time around the pool near the two lower bedrooms, and it was very relaxing! Casa Santosha has everything you need just bring your bathing suit! 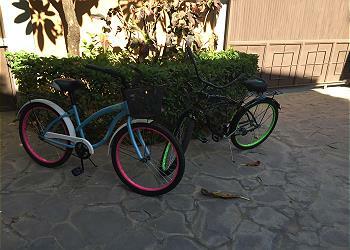 There's a BBQ grill and beach cruisers for trips to Tamarindo. Also, the RPM staff was very helpful. They set up our van from the airport and we had wonderful chats with Ronny, our driver to and from the Airport. Mauricio saved the day when we roade our bikes too far and needed a ride back to the house. The staff kept an eye on the house so we worried about nothing except spennding time with great friends and the beautiful beach. We'll be back! Love it! Response:Thank you for the great review and so glad to hear you had a great girls vacation. Come back and see us again! Response:We're glad you had a good stay. Hope you come back in the future and stay with us! We loved staying at Casa Santosha. Highlights of the place are: -away from the touristy areas -super modern and nicely furnished -in a quiet neighborhood -perfect for friends because all the rooms are separate -close to a market to get the essentials The beach and water in Costa Rica were beautiful and Tamarindo has a lot of things to do and fun activities. If I could be there again right now, I would! Response:Thank you very much for the great review and details on what you appreciated. We hope you will come back soon. We stayed in Casa Santosha for a week with some friends and had the time of our lives! The home is gorgeous, modernly and comfortably furnished, clean, has the best air conditioning in the world, has every modern amenity you want without feeling stuffy, and is absolutely comfortable and romantic for several couples (or families) to stay in. It's far enough away from the hustle and bustle of downtown Tamarindo, so it feels like a small town beach villa, but it's a short bike ride downtown and you can party the night away in the center of the tourist area. 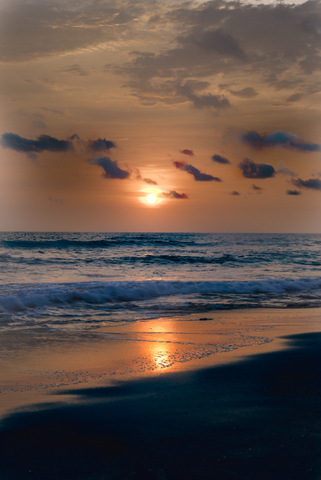 It's also within walking distance to beautiful Langosta beach, several restaurants, bike and surf rental store, a small market and the RPM travel office so you can book your day trips/excursions while you're in town. Seriously, you won't regret choosing this home for your trip. 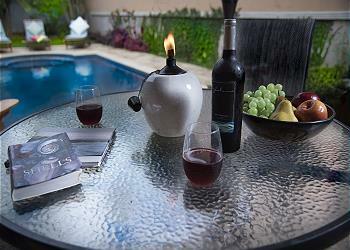 The comfort of Casa Santosha was one the best parts of our time in Costa Rica! Response:Thank you for the great review. 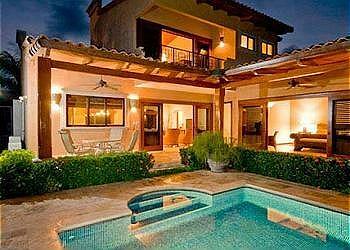 We are so glad you had a good time and enjoyed beautiful Casa Santosha. Please come back and see us again next year! This place is the best. 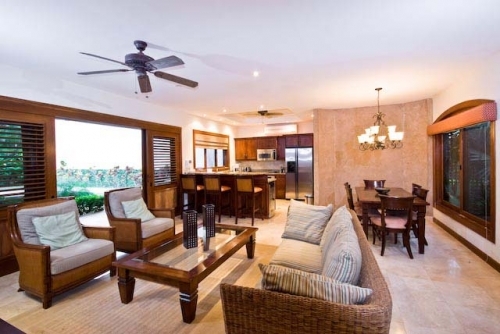 If you are looking for a clean, spacious and private home you are in luck, Casa Santosha has that as well as being walking distance to the beach and market. 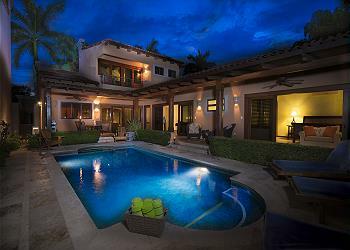 My favorite things about this place include: - 3 very private bedrooms with private access (perfect for groups) - A gorgeous pool and a private back yard area for lounging and sipping ice cold Imperials. - Air conditioning in each room :) - Bikes! We used them everyday to cruise into Tamarindo - Location. 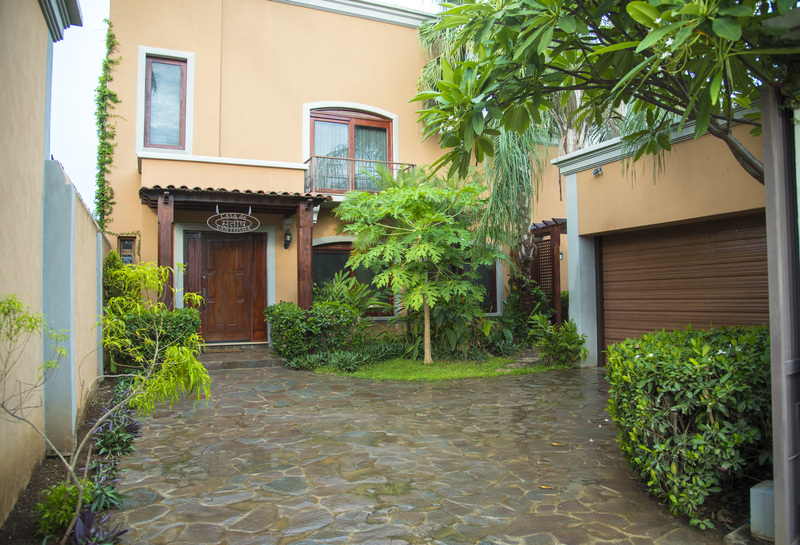 Walking distance to the market and the beach and Tamarindo. - RPM staff. They were so friendly and helpful. They helped us plan our tours, as well as helped us with local recommendations. Response:Thank you so much for the great review and the list of your favorite things. This helps future visitors as well. We hope to see you again very soon! Modern home with pool and fully equipped kitchen. There is a small grocery store half a block away! The house is steps from the beach and only a short walk to the center of town. Bikes are available on property if you don't feel like walking. There are much larger grocery stores in town. There we were able to procure all that we needed for the duration of our stay. My husband and I enjoyed our stay very much. We were able to relax and didn't have to worry about a thing. Looking forward to our next visit! Response:Thank you so much for the review. We are so glad you were able to relax during your stay. Come back and visit again! Response:So glad you had a great time at Casa Santosha. Thanks for the details and hope to see you again soon.